The unique substance which is like a vitamin. Donor of methyl groups. In small quantities is produced by the body, but the amounts are too small to satisfy the needs of the body. It has a number of health-promoting properties and is highly appreciated by athletes because it helps increase muscle mass. Determination of the optimal dosage of TMG is not easy. It depends on the physiological condition of the organism. 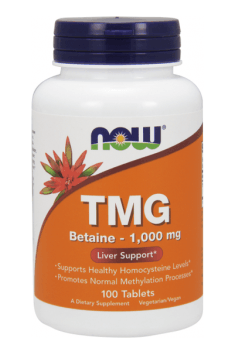 Scientists believe that adults need 1,000 to 3,000 mg a day TMG. This means that, according to needs, can be taken from 1 to 3 tablets per day. You can divide the dose and take it at intervals of a few hours. To better absorption and improve the bioavailability of active substances is best to take them with a meal or immediately after it. If we follow the recommended doses, the product can be taken for a long time. From my experience I know that those who regularly use TMG definitely sleep better and have more energy after waking up. The supplement is even more effective when combined with a choline, vitamin B12 and folic acid.